A fine, smart, funny newcomer brings a bit of Bridget Jones, a touch of High Fidelity, a high pop-cultural IQ, and a refreshing emotional take to her debut outing. 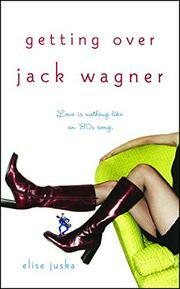 Eliza Simon’s first crush, at age ten, was Jack Wagner, the airbrushed pop heartthrob to whom she devotes herself when her distant, jazz-buff father disappears from her life. At 26, her tastes have changed, but not that much. There’s been a string of “rock star” boyfriends, each dumped as soon as Eliza spots his fatal flaw: that he’s human, not the romantic, über-cool ideal she’d thought. A copywriter at a travel agency, Eliza hangs out at a local club, picks up musicians, watches Behind the Music and ’80s sitcoms, and brings tuna casserole and irony to monthly dinners with her family. She’s also working (or not working) on her book, a guide to dating rock stars, each chapter starting with a mix tape and telling the story of one of her boyfriends—the dark, brooding guitarist and laid-back sax-player of high school; the organic, communard, jam-band singer in college—the same stories as the novel now tells. Her book is the only thing Eliza doesn’t share with best friends, neither fast, funny Andrew (who, in a movie, she tells us, would turn out to be her true love) nor sweet, understanding, hippie-ish Hannah. Sister Camilla’s pregnancy and Hannah’s engagement jar Eliza into doing things differently, and she goes on a date with a securities analyst. Which, amusingly, is even worse than she’d feared. When that doesn’t change her life, she plunges into crisis (and flails about for an ending for her book), nicely resolved in a moving, genuine, growing-up moment. Much is overfamiliar here (snack cakes as a food group; the “perfect” sister; Eliza being wacky because she talks to her cat), and a multiply pierced 26-year-old bemoaning spinsterhood gives pause at this late date. Overall, though, clever structure, swift pacing, emotional insight, and an ultimately charming voice make this one a standout.